We have a wide selection of USDA Choice Certified Hereford Beef, Supreme Tender Pork, Chicken by Smart Chicken and Tyson, Fish and Seafood. All are fresh and we have competitive prices. Our butcher block also has items ready to be put on the grill or in the oven which means less prep time for you. Stop by and explore what we have to offer you. Can’t find what you are looking for? Ask one of our meat experts and they will be glad to help you. 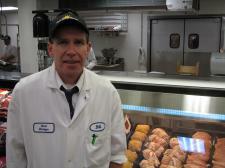 Bill Havranek is the Meat Manager. Let him know if you are looking for something special and he will try and get it for you. Look for our MEGA MEAT SALE in the Fall and the Spring for extra special prices and get specialty cuts just the way you want it cut and wrapped.